This young Phillies season has reached a new low. 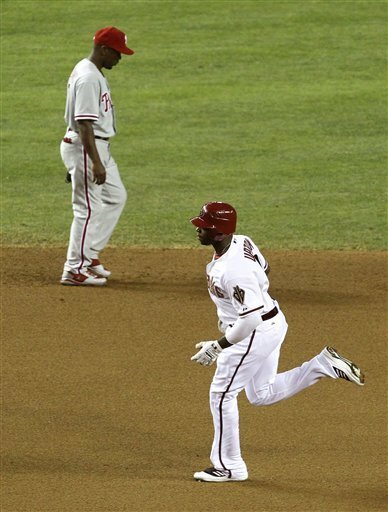 In a game that was missing both Cliff Lee and Hunter Pence to injuries, the Phillies dropped the series opener to the Diamondbacks, 9-5. Arizona got the Kyle Kendrick early and often, tapping into the spot starter for seven runs on 11 hits in three-plus innings. In the mean time, spot starter Wade Miley pitched six scoreless innings, allowing only two hits (doubles to Freddy Galvis and John Mayberry). All but one of the starters in the Diamondbacks’ line up, including Miley, had a hit. The Phillies almost scored their first run in the 8th. Pete Orr hit a two-out double to right field but was gunned out at the plate on the following single by Juan Pierre. They tried to mount a miracle comeback in the 9th. Laynce Nix hit an RBI double that sparked the rally. Shane Victorino then ripped a three-run homer and Carlos Ruiz followed with a solo shot, all off Joe Patterson, to pull the Phillies within 9-5 before recording an out. Mayberry then followed with a single but that was it. Galvis hit into a double play and Orr grounded out to end the game. 2B: Galvis (4), Mayberry (2), Orr (2). HR: Victorino (3), Ruiz (2). WP: Miley (). LP: Kendrick (). I’m sorry that you have to find the words to write about this team every day. Things will turn around at some point (hopefully).